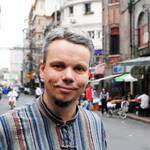 Dr. Marcus Hernig studied Sinology and German Philology, in Bochum and Nanjing. A resident of China for an extensive period, he lived for many years in the district of Hongkou in Shanghai, where Chinese writers, intellectuals and artists lived and still live. The cross-cultural encounter of Chinese and Western ideas and lifestyles – so visible in Shanghai – is one of his key interests and writing topics. From 2007 to 2011, he was a Professor at Zhejiang University where he taught Intercultural Studies before taking a position as Director of the Goethe Institute in Kyoto from 2011 to 2014. Marcus is currently engaged in German Studies at University of Science and Technology Shanghai and as Senior Consultant in cross-cultural projects focusing on cultural foundations of economical behavior for sinogermantrade.com. Co-founder of SHANGHAI-FLANEUR, he also published several books including Slap bang in the middle of China – Culture, History and Everyday Life (China mittendrin: Geschichte, Kultur, Alltag) and more recently Journey into Heaven – China in Six Courses (Eine Himmelsreise – China in sechs Gängen) (Publisher: DIE ANDERE BIBLIOTHEK), China – A Portrait of A Country (2013 and 2014) for GEO-Magazine on Shanghai, Beijing and Hong Kong. The newest publication is “Chinas belly – why the West should think less to understand the East (Chinas Bauch – Warum der Westen weniger denken sollte, um den Osten besser zu verstehen). Back in Shanghai now, he is available again for talks, (scenic) book readings on special occasions and for walks. it was an amazing afternoon with Dr. Marcus Hernig! His knowledge about China, his experiences, his ideas and speech are admirable! I can' t imagine a better guide and I thank him very much. The walk yesterday was very nice. The topic Hongkou district was very good. The Guide was very good. He used to live in the Hongkou district and could show/inform us also about some of his personal experiences, etc. Everything was good. Nice weather, nice group (right amount of people, we were 13 people) and very good guide.